Triathlon has reached the point where it is truly a worldwide sport. There are races on every major continent, in every type of environment, in pretty much each month of the year. As the number of choices of races increases, travel and vacation destinations become more enticing. At the same time, the ability to fly to a destination event also can present you with a number of challenges, one of the toughest to overcome being the local environmental conditions. There are a number of 70.3 and IRONMAN races in October and November that will be held in much warmer conditions than many of you will be experiencing in much of the Northern Hemisphere. This issue is a double edged sword. On one hand, there is the experience of going somewhere new and exciting, along with racing in a warm venue when the days at home are cooling off. On the other hand is a reduction in performance by racing in heat, in some athletes by as much as 10 percent. The majority of studies that have researched heat, and its effects on athletic performance, conclude that approximately 8 to 12 days are required for a well-conditioned athlete to adapt or acclimate to the heat. For many amateur racers, arriving at a race up to two weeks ahead of the event just isn’t possible or practical. However, it is possible to prepare your body and mind for the added physiological stress of racing in much higher temperatures and humidity than one is accustomed to. First, it is important to observe what happens during acclimatization. Humans are different from most mammals in that we use the skin’s surface area for cooling rather than the lungs (this is why animals pant). Blood is drawn from your muscles and organs to the network of capillaries next to your skin to transfer heat via convection. Upon arriving in a hot tropical destination, this requires an increase in blood volume; initially this is affected by your heart beating faster and as your body adapts, plasma volume increases. As your body conditions over the 10 day period, your sweat rate gradually increases, your point of starting to sweat starts earlier, perceived exertion drops and your ability to perform physical tasks to your potential rises. Effective cooling of your body requires an adapted blood volume and a stabilized sweat rate resulting in stable core body temperature. There are plenty of studies1 as to the physiological challenges the body undergoes with the stress of high ambient temperature, but how to prepare your body with limited time is much more anecdotal. Simply adding heat to high intensity training sessions will pile on unnecessary stress and possibly have a detrimental effect on training. Adaptation begins even when you are still training with a reasonably high physical load. The idea is to slowly get your body used to exercising in a higher than normal temperature – even going so far as to replicate the race venue’s heat and humidity without adding extra load on the system. Begin your adaptation protocol three weeks out from your race. Aim for five consecutive days consisting of 90 minutes on the trainer with a heart rate of zone 2-3 using increasing cadences of over 100rpm to drive your heart rate into the appropriate zone. If your heart rate elevates too high, back off until it is back in control. Do this at the end of the day after all other key sessions have been completed. Two weeks out, this can be reduced to three sessions, with a day between sessions. One of the goals is to recreate the conditions that you will encounter on the race course. For many, this means setting up a trainer in the bathroom, turning on the heater and the shower to increase humidity. You can also set up a humidifier if the bathroom isn’t an option. Aim for a room temperature of 30C (86F) along with 60 percent humidity. We have also had success with athletes overdressing by wearing tights, long sleeves, and a hat while running on a treadmill. There are also studies that have indicated sitting in a sauna for 30 minutes after all exercise has been completed every day will also help increase the body’s ability to handle heat and humidity2. This also helps to increase the mental stress of elevated core temperature and what to expect race day. Interestingly, decision making during exercise under extreme heat stress becomes more demanding on the brain. Your brain requires glucose to function optimally and by default will override the muscles access to sugar. When your blood sugar levels dip, your brain also suffers and this is why during races in the heat, you can often experience more negative feelings when racing in hot temperatures than during “normal” temperatures. In addition to the above protocol, it is important to know your sweat rate. Weigh yourself pre and post exercise including the amount you drank; subtract the difference and divide by the duration. This is your hourly sweat rate. Being aware of this and the fact that you can typically replace 800ml to 1 liter of fluid per hour will give you a baseline for race day. Also remember to include 700 to 1000mg of sodium per liter of fluid to maintain electrolyte balance. Upon arrival at your race location make sure you pay attention to hydration. Many athletes will not use the air conditioning in the cars or rooms in order to acclimatize. However don’t do this at the expense of not being able to sleep and generally being uncomfortable as this doesn’t put one in a good frame of mind. 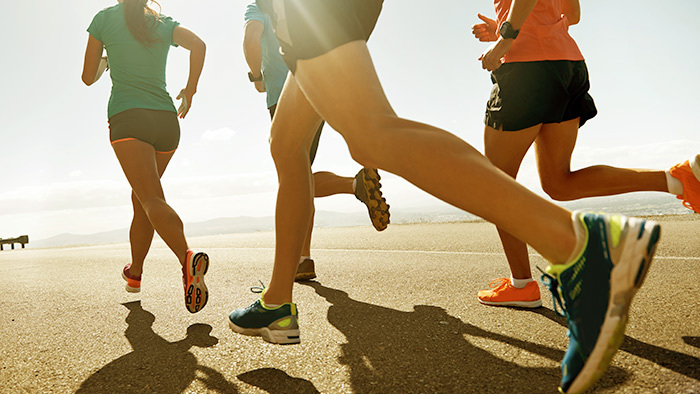 You should also be prepared to run at a slower pace on race day due to the heat. Be cognizant of what your body is going through and you will have a successful race. Racing in warmer climates than you live in requires some specific training and preparation. With some simple changes and proactive measures, you can be ready to reach your goals.